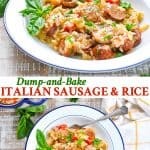 Spend just 10 minutes stirring together the raw ingredients and this Dump-and-Bake Italian Sausage Recipe with Rice is ready for the oven! There’s no prep work necessary for an easy dinner that bakes in one dish! 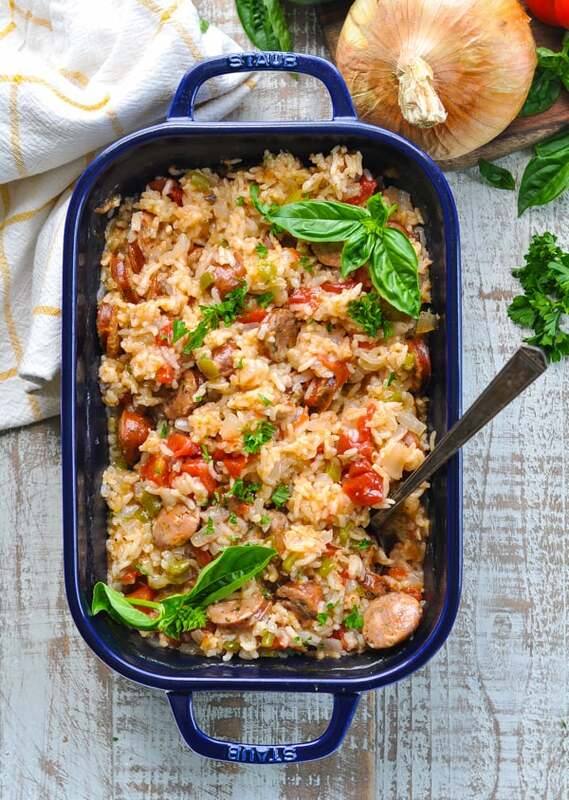 Spend just 10 minutes stirring together the raw ingredients and this Dump-and-Bake Italian Sausage Recipe with Rice is ready for the oven! 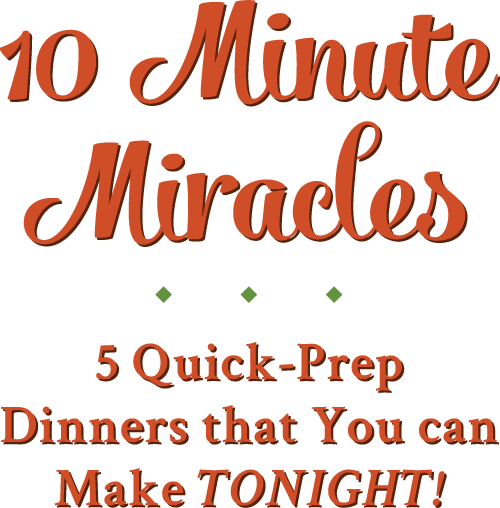 If you’re on the hunt for easy dinners that make your weeknights just a little bit easier, then I have a treat for you today! 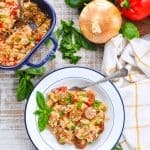 I’m taking the stress, the rush, and the hassle out of mealtime with a quick-prep Italian sausage recipe that suits your busy life. 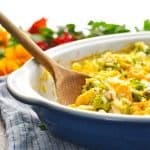 Unlike most casseroles which require pre-cooking the ingredients before the dish is assembled, my dump-and-bake meals eliminate the prep work with simple one pot recipes! I think that I’m doing well if I can get a few veggies chopped and stirred together, so I’m not interested in pre-boiling rice, browning Italian sausages, or washing a sink full of dirty dishes. 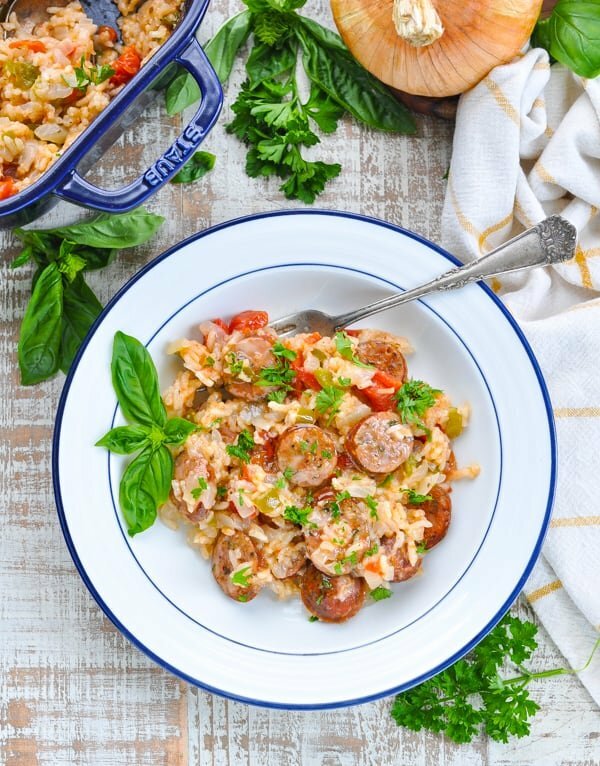 Do you want to see how easy this Italian sausage recipe truly is?! 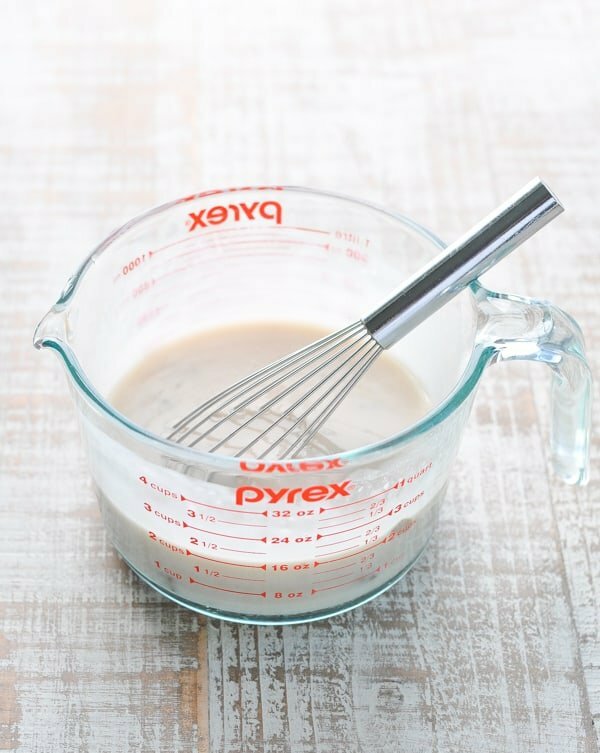 First, whisk together the “sauce” or the liquid base for your casserole. This is just a combination of condensed Cream of Mushroom soup (I use Campbell’s Healthy Request) and water. 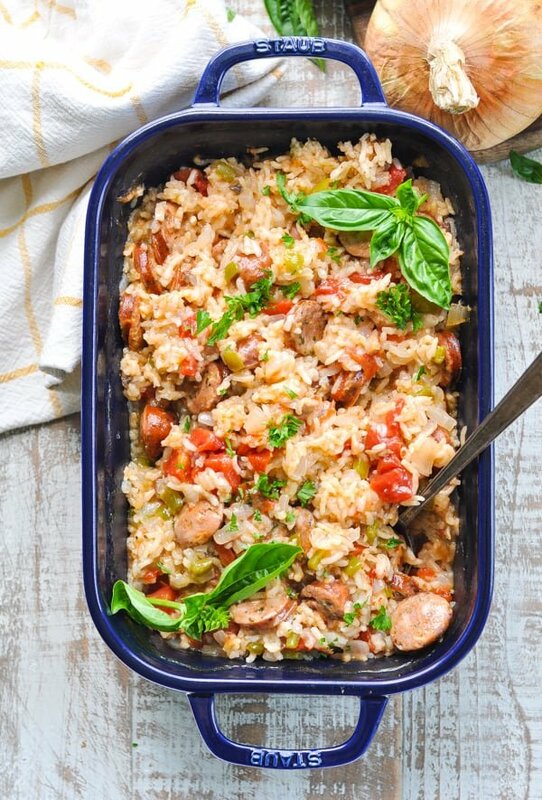 Combine the sauce with the rest of the raw ingredients in your dish: fully cooked Italian Style Smoked Chicken Sausage, bell pepper, onion, diced tomatoes, uncooked white rice, and salt and pepper. It might look like a lot of liquid right now, but the rice will absorb the liquid as the casserole bakes, resulting in a creamy risotto-like finished product. 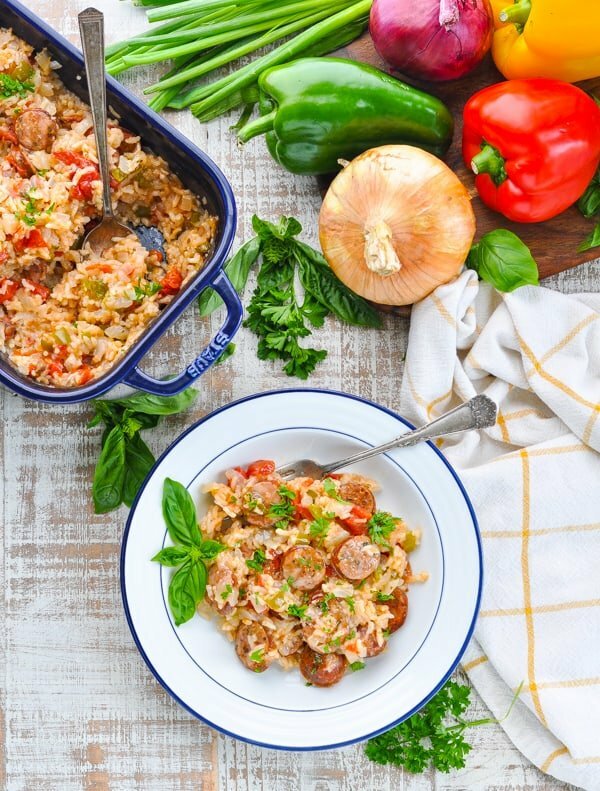 Stir the Italian sausage into the casserole about halfway through the cooking time. Since I’m using fully-cooked chicken sausage here, the meat doesn’t need very long to heat through. 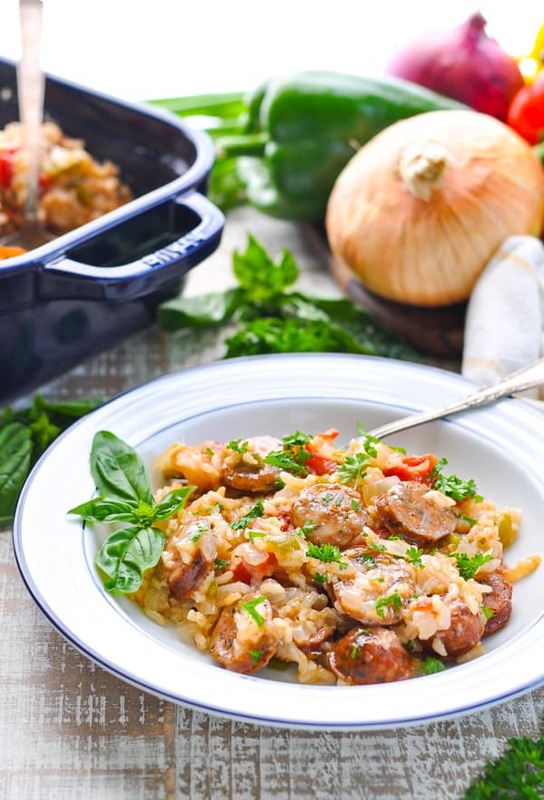 If you prefer to use raw Italian sausage, that will work too. You’ll need to add it to the dish with all of the other ingredients at the beginning so that it cooks through by the time the rice is done. 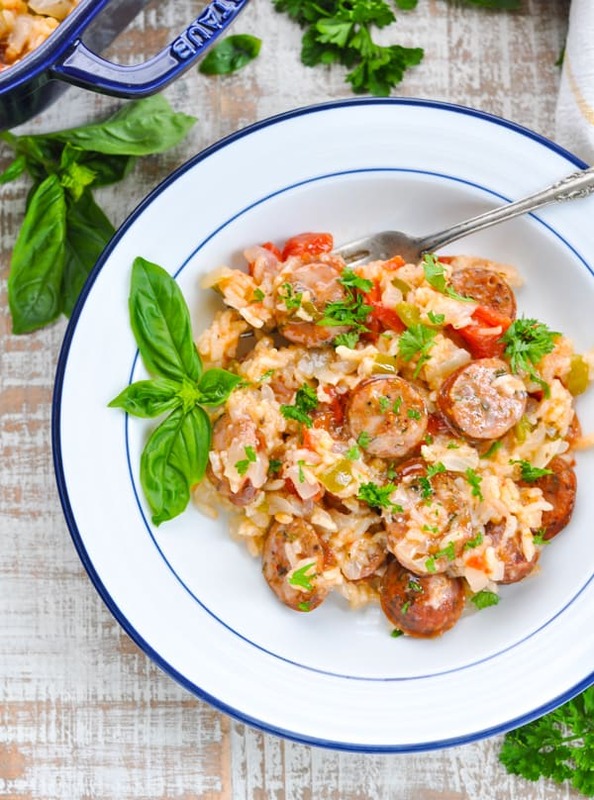 Also, be aware that some of the grease from the sausage will be left in the dish, so you might like to try raw Italian turkey sausage for a leaner option. 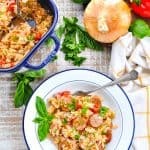 After about 1 hour – 1 hour, 15 minutes, you will have a lovely Italian sausage recipe that’s complete with fresh veggies and creamy, tender rice. 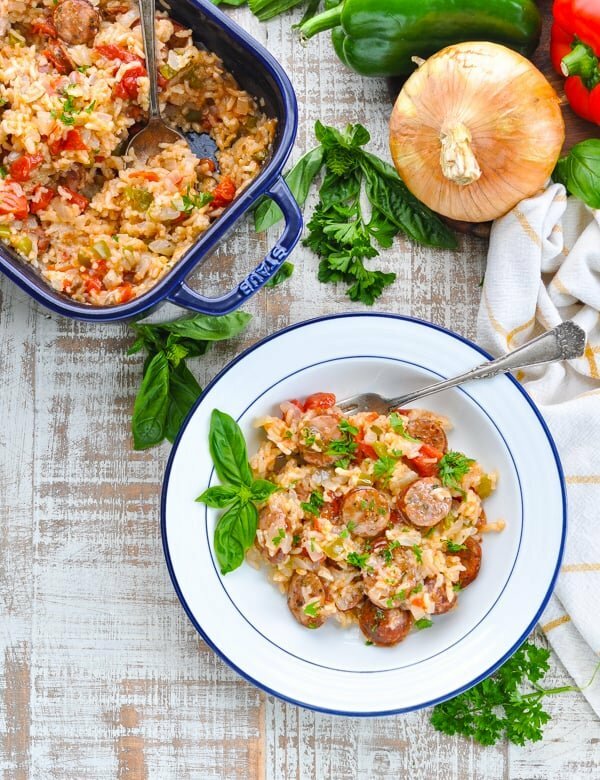 It’s like a lazy mom’s version of Italian Sausage Risotto — and it’s the key to your busy weeknight schedule! Enjoy, friends! 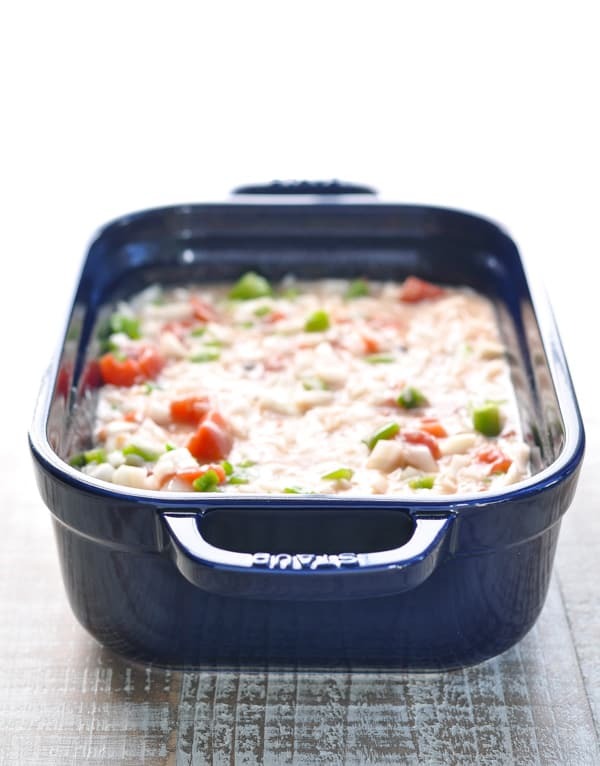 Preheat oven to 375 degrees F. Spray a 3 quart baking dish with cooking spray. Add cream of mushroom soup and water to the prepared dish. Whisk together until completely combined. Stir in uncooked rice, tomatoes, bell pepper, and onion. Season with about ½ teaspoon salt and ¼ teaspoon pepper. Stir again. Cover tightly with foil and bake for 30 minutes. Remove from oven and stir in sausage. Cover again, return to oven, and bake for 30 more minutes. At this point, give the casserole a stir and check the rice for doneness. 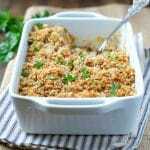 If the rice isn’t completely tender, cover the dish and continue baking for 10-15 more minutes, or until most of the liquid is absorbed and rice is cooked. Cooking Just for Two? 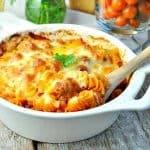 Cut the ingredients in half and bake the casserole in an 8-inch square pan! *If you prefer to use raw Italian sausage, that will work too. You'll need to add it to the dish with all of the other ingredients at the beginning of your cooking time so that it has cooks through by the time the rice is done. Also, be aware that some of the grease from the sausage will be left in the dish (you can stir it in), so you might like to try raw Italian turkey sausage for a leaner option. I prefer to use brown rice. Do you know if this changes the cook time? 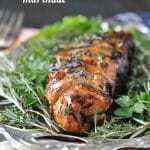 I want to try this recipe with instant white rice. 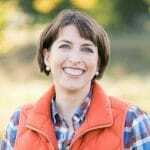 What changes would you recommend for cook time, ECT? The instant rice will obviously cook faster, but it also absorbs less liquid. So you’ll need to adjust the cooking time and the liquid ratio. I haven’t tested this recipe with the instant rice, but I would first try leaving all ingredients the same, but using 1 1/2 cups of instant rice total. Bake the dish at 425 degrees for a total of about 30 minutes. Stir in the sausage about halfway through. Really, just keep an eye on it so that you will know when the rice is tender and it doesn’t get overbaked. Hope that helps!